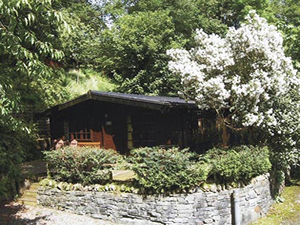 High quality "Alpine" style self catering Log Cabin in the Central Lake District. Enjoying a lovely peaceful setting amongst 18½ acres of mature Lakeland Woodland, this splendid 2 Bedroom cabin is now available which provides luxury accommodation for up to 4 people and is "dog friendly" (up to 2 well behaved dogs welcome). 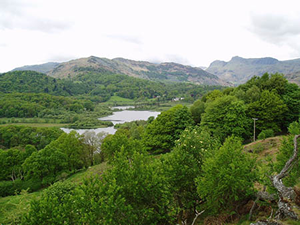 Whinfell Tarn is located in a quiet private position and provides good sized accommodation with private parking for 1 vehicle. Extra vehicles can be parked in our main car park. Free WiFi throughout the cabin. Bedroom 1 has a double bed, fitted wardrobe, wall mounted heater and has double glazing overlooking the decked area and rockery garden. Bedroom 2 has twin beds and fitted wardrobe and wall mounted heater. Shower Room with shower cubicle/electric shower, W.C, Vanity Unit with shaver socket and light, heated towel rail and electric wall mounted fan heater. Outside there is a secure gated decked area plus rockery garden with BBQ and comfortable garden furniture. Visitors to Whinfell Tarn also have free use of the Estate Leisure Facilities (open 1st March to 15th November) including family sized swimming pool with built in jacuzzi, seating area, table tennis area, sauna cabin (local fees apply) and changing rooms. The building also has a public payphone, communal laundry, and a small shop.